During the weekend of 27-30 April 2018, 180 ARMN members and other area residents answered the call to participate in the third annual City Nature Challenge. The Nature Challenge seeks to encourage interest in urban nature by having groups compete to record and identify the nature around them. It began in 2016 as a friendly competition between Los Angeles and San Francisco to see which area could document the most species and involve the most participants. It went national in 2017 and international in 2018, this year including 68 urban areas worldwide, including greater Washington, DC. Photo courtesy of Marion Jordan. and assistants on various nature walks, ARMN members helped raise interest and educate other community members in nature observation, like John and Josie Buchanan, seen here examining a salamander they found on their ARMN-led hike in Barcroft Park. Photo courtesy of Carol Mullen. Klingelhofer led more than 10 people on a 22-mile route through Long Branch, Barcroft, Fort F. C. Smith, and other Arlington parks along the Potomac. Cyclist Carol Mullen snapped the accompanying photo of a water snake swallowing a fish at Four Mile Run. and chirps” fieldtrip at Huntley Meadows on April 30th, including photos of a Hooded Merganser with ducklings. All City Nature Challenge participants documented their observations on iNaturalist, a free app and website that allows individuals to easily upload, share, and identify species. The results were impressive: we helped the DC Metro area come in 5th place world-wide for overall number of observations (22,866), 4th overall in number of observers (886), and 8th overall in number of species (1,850). 537 people helped make 38,968 species identifications for our area. This year Boston had thrown down a specific challenge to DC: we bested them in observations and species and came in one place behind them in total number of observers. Our area’s most frequently observed species were the Common Blue Violet for plants, the American Robin for birds, and the White-tailed Deer for mammals. The City Nature Challenge celebrates and supports two vital functions of citizen science: it brings members of the community together to enhance their appreciation of nature, and it provides scientists with valuable data on biodiversity that can help guide the understanding and preservation of our natural resources. Thanks to all members of ARMN and the greater community who participated. Save the date for our next big citizen science project: the Arlington Bioblitz to be held on Saturday, September 15, 2018! If September seems too far off to collect more environmental data, then look for our next blog piece on how iNaturalist can be used to map a whole variety of observations that can help us better understand our environment. From time-to-time, ARMN’s Membership Committee posts profiles of our members including how they came to be master naturalists, which parts of nature they most enjoy, and how they have an impact on the environment around them. Here is the latest biography of Arlington staff employee, Sarah Archer, who graduated in the Fall 2013 ARMN training class. Sarah currently manages Arlington’s Invasive Plant Program and is involved with starting the County’s native plant nursery. She is a valuable collaborator for ARMN on a wide variety of projects. I have been able to participate in many ARMN projects over the years, but my favorite has to be the restoration of the Barcroft Magnolia Bog. The success of this project was due to all of the great work done by ARMN members. Marion Jordan, Jim Hurley, Marty Nielson, and others were instrumental in building momentum around the restoration work through community outreach to nearby homeowners and Claremont Elementary School. We received an award from the Virginia Association of Counties for this project because of the collaboration between county staff and groups like ARMN. I am also really excited about Arlington’s new Native Plant Nursery . We usually have workdays at the nursery every Thursday from 3 – 5 pm. I am also involved with the RiP/ARMN supported invasive plant removal events at Tuckahoe, Ft. Bennett, Madison Manor, Long Branch, Gulf Branch, and Haley/Oakridge/Gunston (“HOG”) parks. These events are led by our ARMN volunteer site leaders and are great opportunities for community volunteers to learn about invasive plant identification and removal techniques. I am always amazed at how much drive and passion the site leaders have to act as stewards for their neighborhood parks! Earth Day 2014, at an Arlington park. Sarah is second from the right. What brought you to ARMN?/How did you learn about ARMN? The first time I heard about the Master Naturalist program was from my mom when she took the training in Illinois. I was lucky to get the opportunity to take the ARMN course when they needed an Arlington staff member to open and close building during the training sessions. I really appreciate the strong relationships that ARMN builds with their partner groups and how informed and motivated the volunteers are! 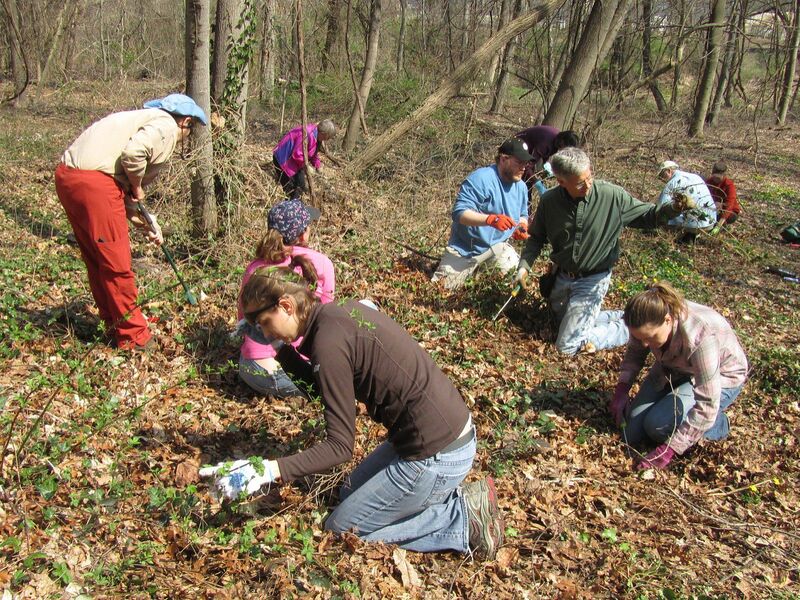 Arlington County wouldn’t be able to do many of our natural resource conservation and restoration projects without the support of community groups, particularly ARMN. ARMN volunteers do so much for Arlington’s Parks and Natural Resources Division including not just invasive plant removal, but education and outreach, project planning, surveying, planting, nursery work, etc. It’s a pretty long list of all of the different types of volunteer projects ARMN participates in. 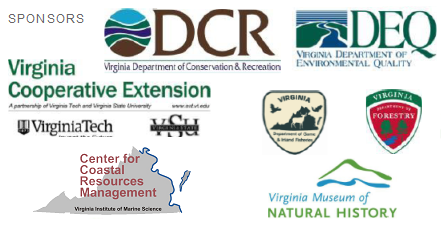 The ARMN membership is so diverse in expertise and interests that they can support almost any project that we have! Tell us something about your childhood/adulthood experiences that shaped your perspective on nature. I was a Girl Scout in elementary school and really enjoyed all of the outdoor activities like camping and hiking. I actually pulled my first invasive plant, garlic mustard (Alliaria petiolata), when I was in Girl Scouts! I didn’t really get interested in pursuing a nature-related career until I joined the Student Conservation Association (SCA) in 2007 after I graduated from Illinois State University (ISU), and did several internships with SCA related to environmental restoration. During college, I worked with a native plant landscaping company and was a gardener for a few private residents during my summers off. In 2007, I received undergraduate degrees in dance and anthropology from ISU. After college, I went to California to work for the Bureau of Land Management as an SCA intern and then worked on a trail crew on the Pacific Crest Trail. In 2008, I moved to Maryland with another SCA internship with the Nature Conservancy, and managed invasive plants in the Potomac Gorge. I began working with the Arlington County Department of Parks and Recreation in 2009 and received a master’s degree in Natural Resources from Virginia Tech in 2012. I enjoy many types of social dance, including square, salsa, blues, and kizomba. In college, I performed as a “koken” in a Kabuki production of Othello under the direction of Shozo Sato, an internationally renowned Japanese theater director. Sarah doing a fan dance (not Kabuki, but close). I also love international travel and have a trip planned to Peru, Argentina, and Uruguay over the Christmas holidays! Throughout the year, ARMN volunteers contribute to a myriad of service activities that benefit our neighborhoods and communities. For Martin Luther King Jr. holiday weekend, ARMN inivites you to join our dedicated volunteers to honor Dr. King’s legacy by participating in two of our focus service projects to restore habitat in Barcroft Park and in Tuckahoe Park. Farrah and Brooke Alexander can barely be seen waving at the base of this “broccoli tree” that probably only had a few more years left before final choking. Autumn 2012, Barcroft Park. 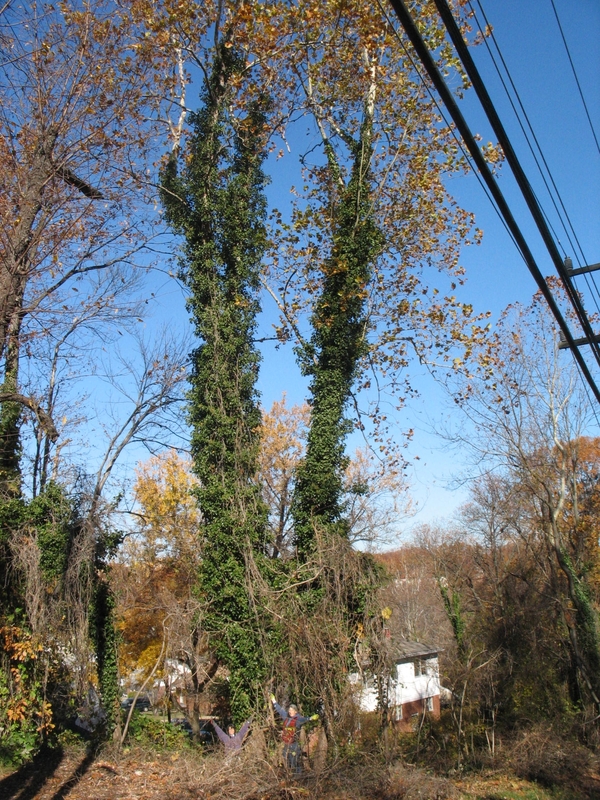 Our main focus will be to clear ivy off the trees so that IPC (Invasive Plant Control), Arlington County’s contractor, will be able to efficiently treat the ivy remaining on the ground. After the clearing, Jim Hurley, ARMN Vice President and Chair of the Service Committee, will lead a walk to view the new plantings done in December and results of work done over the past year. It is now early September, 2012, following the extreme extended heat wave in the Washington DC region, and a walk around Barcroft Park will reveal whole swaths of brown, dead plants at ground level, and many dead tree stems, still upright, listing, or lying on their sides, leaves crisping. It wasn’t the heat that did this. With the exception of a few big trees felled by the June 29 derecho, most of these browning plants in Barcroft met their demise at the hands of Invasive Plant Control (IPC) technicians, who completed five weeks of an intensive first treatment of 40 acres of the park, providentially, just a few hours before that derecho blew through. The day before, the IPC crew leader walked me, Sarah Archer and Greg Zell through the park to observe the results, which were impressive. Porcelainberry: dead or browning; Multiflora Rose: wilting thickets; Oriental Bittersweet, Japanese Honeysuckle: yellowing or dead; Mimosa, Norway Maple, Japanese Pagoda stems on the ground; 15′ Bush Honeysuckle: cut at the ground, bases painted blue, etc., etc., some 25 species of exotics targeted for destruction. And what about Tree of Heaven, English Ivy, Periwinkle, and Wintercreeper? Tree of Heaven, really Tree from Hell for the intensity of its infestation of natural areas, roadsides, and farmland in the East, dubbed the Stinkbaum by Germans, was protected by the heat wave. Basal bark treatment, the only way to kill this insidious, suckering spreader, is only effective below 85 degrees, so IPC will be back in the fall to treat this Ailanthus altissima, and in the winter to treat the waxy-leaved evergreen vines, when there will be no collateral damage to the deciduous Virginia Creeper, Wild Yam, and native Grape vines intermixed with them. Arlington County’s investment of some $75,000 in professional invasive plant control (including two days of treatment for Lesser Celandine in March) in Barcroft Park this Spring, and the County Board’s allocation of $100,000 for invasive plant contract work in FY 2013 (7/1/12 – 6/30/13), a chunk of which will go to follow-up treatments in Barcroft, has completely changed the game, at least for this park. The scale of the infestation was too great for volunteer efforts. 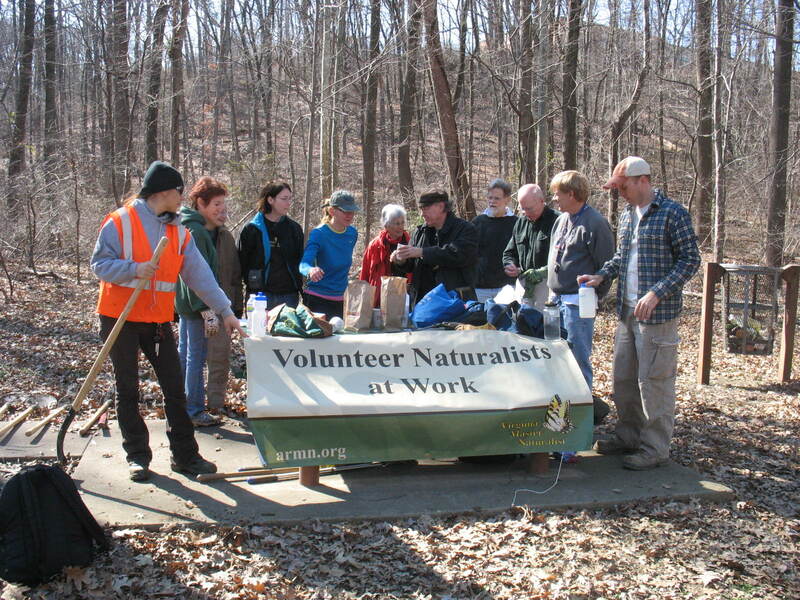 We Master Naturalists conducted some 15 invasive pulls in the park in 2011 and 2012, and we had a big impact in several discrete areas, working with partners including the Tree Stewards, Virginia Native Plant Society, Americorps and other volunteers. However, we only made a small dent in the overall problem. We suspended work in the summer to see the results of the IPC contract work. 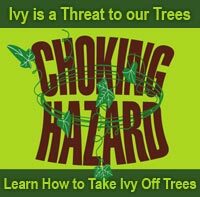 There will be remnant Porcelainberry, Japanese Honeysuckle, Chinese Yam, etc., still visible in September, but IPC will hit them again next Spring, and in the meantime, we can play a useful role doughnutting the English Ivy climbing trees, which will increase the efficiency of IPC’s Ivy work in the winter. This is the work we performed during our last invasive removal day in Barcroft in May, and it is the work we will do beginning with our next Barcroft Focus Project day this coming Saturday. So take a walk through Barcroft Park soon, and see the park on its way to natural health. Or better yet, join us at 9:30 this coming Saturday, September 15 to help us complete the work. Afterwards, we will walk the park and identify remnant invasives for IPC to remove. A natural spaciousness is already opening up. This time next year, it will look very different than just a few short months ago. ARMN Volunteers at Barcroft Park. Photo by J. Hurley.